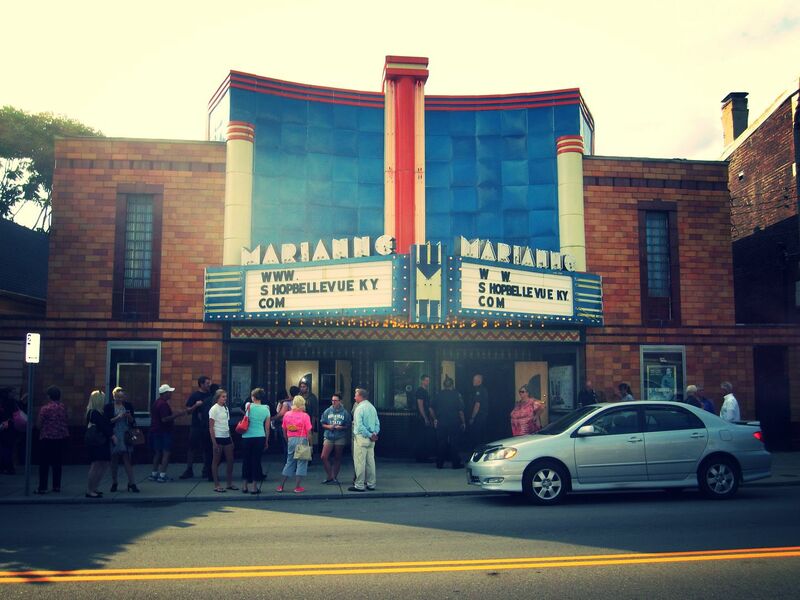 2014 will be one to remember for the Marianne Theater in Bellevue. Exciting new developments transpired at the art deco movie theater in each season this year, culminating in the building make its own big screen debut as a Hollywood film shoot took place outside this week. It all started in March, when the Bellevue City Council announced that it would pursue the purchase of the landmark building. Opened in 1942, the Fairfield Avenue destination was shuttered in 2000 and had been vacant since. "It's not one of those buildings that are on every corner," Mayor Ed Riehl said at the time. Two and a half months later, the city closed on the purchase. In July, the city hosted an open house at the theater to solicit feedback from the community on what would be expected of its redevelopment. The event attracted a large crowd that included 75-year old John P. Smith whose grandparents built the Marianne. "The outside is really good. It's heartbreaking to see the interior in such disrepair," said Smith, who remembered seeing the original runs of classics like Dumbo and Bambi. He thought about buying it himself some years ago but decided that it would not have been a wise financial investment. Now the city hopes someone who thinks otherwise will come to town. The city also promoted the project at Developers Day, when Northern Kentucky's urban cities showed off its assets to potential developers and state legislators. The Marianne was also a common topic on the campaign trail in this year's mayoral race that saw Riehl reelected. In October, the city began the process of having the state review its application to place the Marianne on the National Register of Historic Places. Then in November, after months of work, an estimated cost for a general development project was returned: $1.6 million. That may seem like a hefty price, but the Marianne sure looked like a million bucks and more as The Blunderer shot outside on Thursday night. So, what will 2015 hold for the Marianne? Let us know what you think at The River City News Facebook page, Twitter, or email us!